NHS Grampian has hailed the success of its latest Australian recruitment drive. Pictured are Jane Ewen, left, and Elizabeth Wilson, two of the senior nurses who went on the trip. 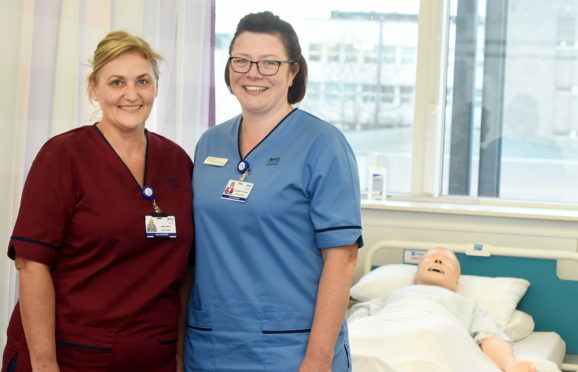 NHS Grampian has been lobbying the Nursing and Midwifery Council (NMC) to reconsider the rules for migrant nurses, opening up the pool of potential recruits. The health board has so far attracted around 50 staff from Down Under, with some of them already hard at work in the north-east. And with the NMC agreeing to relax the rules – meaning nurses and midwives do not need a year of experience on top of their university qualifications to be eligible to sit the NMC exams – there are hopes the second trip will prove to be even more successful. Senior nurse Elizabeth Wilson made the original scouting trip in 2017, and believes it is a huge opportunity. She said it was clear Grampian offered an attractive alternative to many, despite the upheaval involved. “I think we are giving them the opportunity to use their skills, develop and get further training,” she said. “Many are aware of the NHS and are keen to explore what that experience is like. Back in 2017, the P&J exclusively revealed the board would be taking an unprecedented recruitment trip to scout potential nurses and midwives. During the most recent 12-day trip, the nursing team spoke to more than 300 people who were interested in taking up posts. They have had the support of the Western Australia Department of Health in an effort to ensure nurses’ skills do not go to waste. A total of 1,783 nurses and midwives applied for a place on their two-year graduate programme, with just 656 able to secure a place, leaving 1,127 without a position. Jane Ewen, chief nurse in practice education and development, was one of the staff who made the trip. Last year, three of the four recruitment events were managed by external organisations, however this year the board organised each event itself. The programme was a mix of presentations and interviews where those in attendance were given an insight into the health board and also the north-east region. The group even took over some items to give them an insight into the local and national culture – and were surprised at how many people recognised the Aberdeen FC top. Since then, Ms Wilson and Ms Ewen have been carrying out interviews via video calls, twice a day, beginning early in the morning because of the time difference. The NMC interim charge is part of a wider review into its overseas registration process for nurses and midwives trained outside of the EEA. Anyone who secures a visa will be asked to work for a minimum of two years, and will be provided with support to help sit the NMC exams, which consist of a theory and practical element. In August the board revealed it would be offering homegrown nurses the chance to go the other way and train in Western Australia, in a scheme called Perth to Perth. The initiative, which is due to begin this year, means graduates could complete the first of their two-year programme overseas.